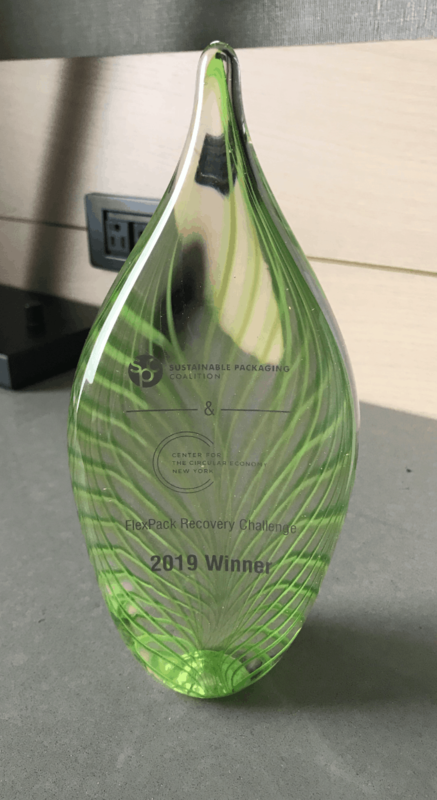 ReNew ELP, who are building the world’s first commercial Cat-HTR plant for End-of-Life Plastic in the UK, were last week awarded first place in the global FlexPack Recovery Challenge at the Sustainable Packaging Coalition (SPC) Impact 2019 conference in Washington. The FlexPack Recovery Challenge is a joint initiative to encourage innovation in sustainable packaging by SPC and The Center for The Circular Economy at Closed Loop Partners. ReNew ELP won the challenge after presenting the Cat-HTR chemical recycling solution at the to a dedicated group of brands and packaging suppliers, including members of the SPC’s Industry Leadership Committee on Multi-Material Flexible Recovery, and Challenge sponsors Dow Chemical, RB, and Transcontinental Packaging.